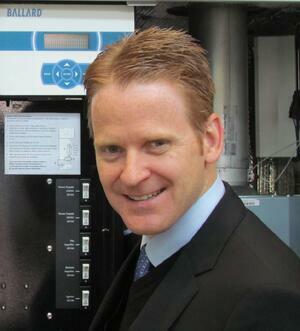 This is an exclusive blog written by Ballard Power Systems President and CEO Randall MacEwen. In June 2017, Mr. MacEwen had the opportunity to share Ballard’s vision for worldwide hydrogen mobility with an enthusiastic audience at the Hydrogen + Fuel Cells Summit in Vancouver, BC. This blog is based off of that presentation. Air pollution is often characterized as dirty factory smokestacks belching out big, billowing black clouds of toxins. But that isn't the entire picture. In many countries, over 30% of air pollutants can be traced to vehicles, making sustainable mobility issues more urgent than ever. Current mobile sources of pollution—the exhaust from cars, buses, planes, trucks and trains—contain harmful toxins that are breathed in by unsuspecting populations on a daily basis leading to serious and impactful health issues. With vehicle exhaust topping the air pollutant list in many regions of the globe, cities are looking for solutions for this growing problem. For example, London plans to introduce an ultra-low emission zone (ULEZ) in 2019, which will require all vehicles in the area to meet exhaust emission standards or pay a daily fee to travel through the area. London, as well as other world cities like Paris, Mexico City and Amsterdam, have committed to taking diesel buses off their streets by 2025. The search for answers has brought with it opportunities for identifying sustainable mobility solutions. The electrification of transportation is progressing quickly. Fuel cell cars are hitting the road, with major automakers such as Toyota, Honda and Hyundai. In fact, Toyota, Hyundai and Honda together expect to lease over 1,000 fuel cell vehicles in the U.S. in 2017. In addition, Ballard is working with automotive OEMs such as Volkswagen Group and Audi to help them advance their own fuel cell programs. Hydrogen infrastructure is now being developed in many regions: with almost 50 hydrogen filling stations in operation today in California and 100 stations expected to be up and operating in Germany between 2018 and 2019. Japan expects to have 160 hydrogen filling stations operating by 2020. The need for sustainable fuel alternatives is perhaps no more evident than in China, where densely populated areas face severe and growing threats from air pollution. China is planning 300 hydrogen filling stations by 2025, with 1,000 such stations expected to be up and running by 2030, illustrative of the country's growing need for fuel cell technology. providing ongoing shipments of more than 300 FCveloCity(R) powered buses in Foshan and Yunfu, China. supplying strategic partner Zhongshan Broad-Ocean Motor Co., Ltd. with 10,000 commercial fuel cell vehicles that will be deployed in its China vehicle leasing business. developing programs to supply 200 kilowatt engines to power urban light rail vehicles for China's CRRC Corporation Ltd., the world's largest train manufacturer. This increase in volume production for fuel cells will continue to push down the cost of fuel cell power modules, which in turn continues to make the technology more commercially available. More and more cities and nations are finding ways to address air pollution and dwindling fossil fuel supplies by implementing sustainable transportation systems, including hydrogen fuel cell technology. However, the urgent need for policymakers to get on board, as well as the need to create more public-private partnerships to advance this technology is becoming all the more evident. One such partnership, the Hydrogen Council, was formed in January 2017 and is made up of 13 global industry leaders committed to accelerating the development and commercialization of hydrogen and fuel cells. The council’s current investment in fuel cell sectors is estimated at 1.4 billion Euros per year. We believe that 30 percent of all commercial electric vehicles will be using a fuel cell as soon as 2030. But it will take more than 13 industry leaders. The fuel cell industry needs to continue its investment in technologies and products to reduce the life cycle cost. We also need to collaborate further to reduce the cost of the hydrogen powertrain, which can be achieved through sharing of key components, such as compressors, hydrogen sensors, and tanks. The industry must also work to continue to attract the best and the brightest, to spur continuous breakthroughs and advancements. A robust eco-system to make hydrogen fuel available at a competitive price has to be an overriding goal. But it isn't just the responsibility of the fuel cell industry. Policy makers at all levels of government need to get involved sustainable mobility planning. Cities should choose fuel cell technologies whenever commercially available for transit buses and other city fleets. Hydrogen should have a place within government emission reduction and electrification plans. And where needed, subsidies should be made available to bridge the gap to commercialization. Advancement of fuel cell technology and all the benefits it brings is possible. But it takes leadership from our industry stepping forward and working together to have 30% of commercial electric vehicles powered by fuel cells by 2030. What do we need to do as an industry, and what do communities need to do to get over the hump to wide-scale adoption of hydrogen fuel cell technology? How can communities and industry leaders better engage policymakers and cities around the adoption of the technology? Join the discussion and let us know your thoughts below and on social media using the hashtag #30by30. Reach out to us @BallardPwr on Twitter.